At the events, according to organizers, “you’ll gather with volunteers near you, talk about the plan to win, and begin organizing to knock doors, make phone calls, and more in your community.” Find an event in your community here. Medicare for All is the most practical, cost-efficient way to provide a single standard of quality care to all. 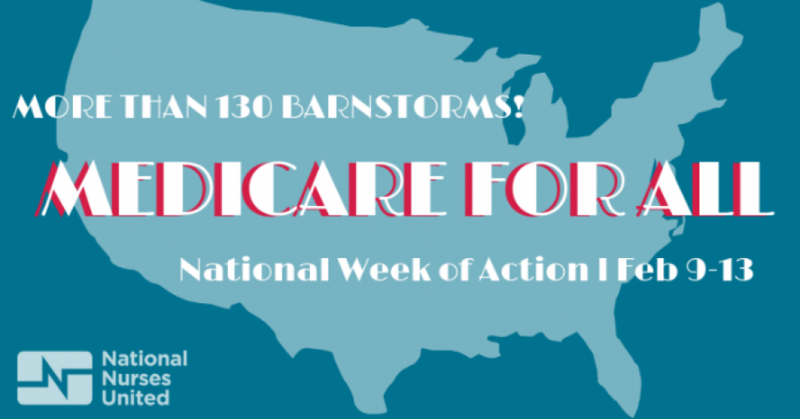 Join the fight to win #MedicareForAll by attending a barnstorm near you as part of the national week of action Feb. 9-13. Recent polling has shown that 70 percent of Americans support a Medicare for All system called for by Sen. Bernie Sanders (I-Vt.) and a growing number of Democrats in Congress. The barnstorms come as Rep. Pramila Jayapal (D-Wash.) is set to introduce the Medicare for All Act of 2019 in the House as early as next week. As patients and healthcare providers nationwide can attest, for those who are living with dire conditions but struggle to afford high quality care, the proposed overhaul can’t come quickly enough—which has inspired some of them to join the grassroots movement for Medicare for All. Briana Moss’ fight to maintain insulin for her Type I diabetes motivated her to host the Dubuque, Iowa barnstorm, according to a statement from NNU. Emily Hibshman, who is hosting the Allentown, Pennsylvania barnstorm, emphasized the importance of pressuring elected officials to support a rapid transition away from the existing for-profit system. 7 out of 10 Americans agree: our current, for-profit health care system isn’t working. It’s time to guarantee health care as a right with Medicare for All.